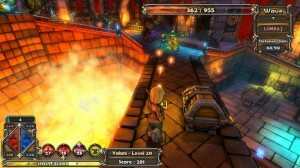 Dungeon Defenders is a third-person mix of tower defence and action RPG developed by Trendy Entertainment. I didn’t spend very long playing this game solely because it’s not really my style of game at all. I almost wish it was, because it has a great art style and solid gameplay. There are plenty of varied character roles and RPG elements to upgrade your character. I think a part of the problem was that I was playing solo, this seems like it could be a very fun game if playing with some friends online, requiring different skill sets. After picking your character, you start in the dungeon you will be defending, before each wave of enemies you have the ability to put up defences like a tower defence game. When you are ready you trigger the wave and then you are able to run around and help out your defences by attacking the incoming enemies. It seems there are plenty of various dungeons to defend, and there must have been twenty or thirty different characters in the version I have. Cons: Basically it’s not my style of game, so I didn’t play it enough to find any real cons.